This hearty Beef and Barley Crockpot Stew takes just minutes to put together, then it cooks all day for unbelievably rich and complex flavor. There's just something about a beef stew simmering in the slow cooker on a cold winter day that makes a house feel cozy and safe. 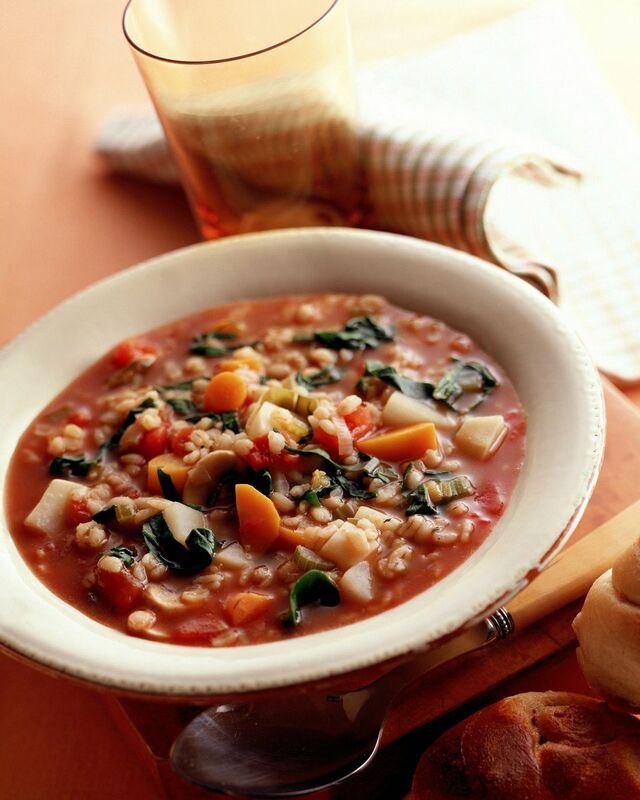 This recipe has lots of vegetables in addition to the beef and barley to add flavor, color, and nutrition. You could add other vegetables if you'd like; some frozen corn would be delicious, as would sliced parsnips. You could stir in some frozen baby peas during the last 20 minutes of cooking if you'd like. Round steak is one of the least expensive cuts of beef. You can buy it in any grocery store. It's better to cube it yourself than to buy those precut cubes of "stew meat". For one thing, the whole cut is less expensive; for another, you can control the size of the cubes. I like to cut the meat 1-1/2" in diameter so the stew seems really beefy. If the stew isn't as thick as you'd like when it's done, you can add a "slurry" of water and cornstarch. For this amount of stew, about 2 tablespoons of cornstarch and 1/4 cup water is right. Mix them together until smooth, then add to the crockpot. Cover and cook on high for 10-20 minutes or until the stew thickens. Serve this stew with a green salad tossed with fresh tomatoes and cubed avocado. That's all you really need for dinner unless you want to add some kind of breadsticks or toasted garlic bread. Trim steak and cut into 1 or 1-1/2" cubes. Toss with flour and marjoram leaves. Spray a 4-5 quart slow cooker with nonstick cooking spray. Combine meat, green beans, carrots, onion, garlic, sliced mushrooms, barley, mushroom gravy or mushroom soup, water, thyme, and pepper in a prepared crockpot, mix well. Cover and cook on low for 10-12 hours, or until beef, vegetables, and barley are tender. If you have a newer slow cooker, cook on low for 7-8 hours. Check for doneness at 6 hours.